Thank you for visiting Playing with Fire’s wedding page! 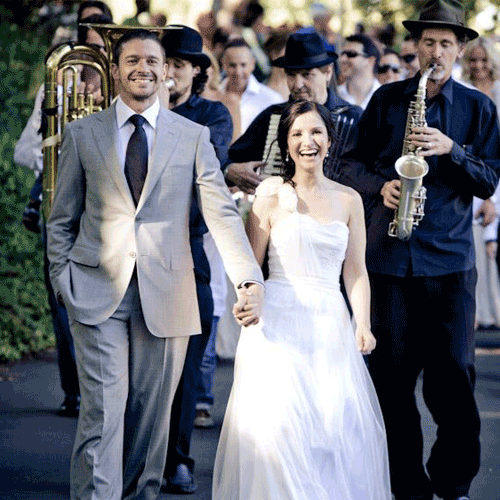 PLAYING WITH FIRE is a collective providing the finest strolling musicians for weddings and functions in Cape Town. We know you want to honour each other, your parents, relatives and friends with the best experience at your wedding that you can afford! Consider how recorded music is all too common; having live musicians is a rare treat, and is a brilliant way to say how much you care for them all. Please let me share my observation of many weddings. Many couples spend a lot on flowers, wedding cakes, dresses and decor. These are certainly important elements, but many couples fail to realize that live music is what makes a wedding festive and memorable! What is truly memorable for guests years later is the intimacy and vibe of a wedding day; not the cakes and decorations! Don’t underestimate the power and magic of live music to settle and prepare a congregation for the special spiritual bond about to happen between two people at a wedding, to catch that moment of exhilaration just after the ceremony, or to break the ice among a group of strangers and to unify them. Good musicians do more for your wedding than all the organizers, decorations and trimmings put together! Don’t skimp on the music! WHEN DO WE NEED MUSIC? WHAT MUSIC COULD WE CHOOSE FOR THE CEREMONY? The following pieces are our most commonly requested songs for entrances, exits and reflective moments at weddings. We happily accommodate individual wishes to play favourite songs. However it is you feel, someone somewhere will have written a song to express just that! 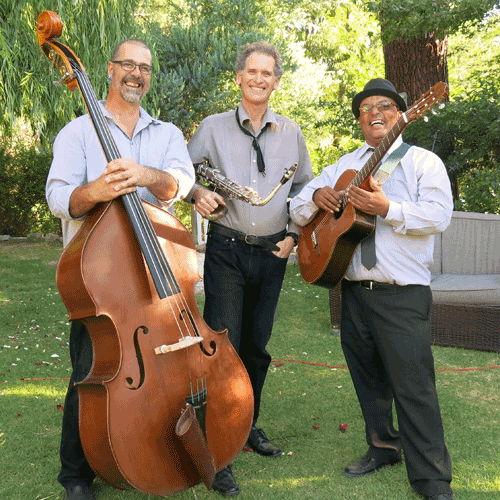 a Jazz trio comprising sax/clarinet, guitar and double bass. 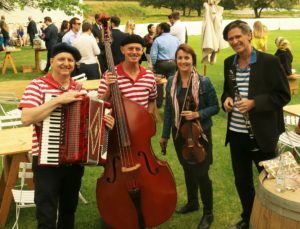 a strolling French/Mediterranean quartet, trio or duo called “Ooh La La!” comprising clarinet, violin, accordion and double bass. Let us transport you and your guests to the banks of the Seine or the steps of Montmatre! 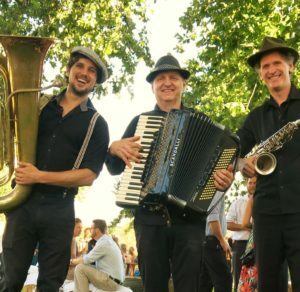 a wacky Balkan band or strolling trio which plays upbeat Klezmer, quirky Balkan and Russian music. Did you see the movie “Black Cat, White Cat”? also solo saxophone with backing tracks. Please visit my gallery of co-musicians and ensembles. I play with delightful professional musicians, all keen to access joy through music. My name is Matthew Reid and I have been playing the clarinet, saxophone and piano for thirty years. I trained at the University of Cape Town and the Royal College of Music in performance. In addition to the music I provide for weddings, corporate and general functions, I perform concertos, chamber music and solo recitals at arts festivals, music societies and public concerts. Error: Error validating access token: Session has expired on Thursday, 21-Mar-19 12:26:35 PDT. The current time is Saturday, 20-Apr-19 20:12:10 PDT.